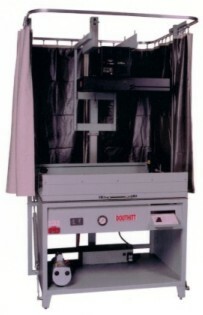 Douthitts OPTION X Vacuum system, an electronically controlled inverse air evacuation system that starts the vacuum in the center of the frame and moves it outward to the edges eliminating the trapping of air. OPTION X gives you the fastest, most consistent overall contact and the best registration. Complete Olite AL 53 Tri-Level 5000 Watt Printing Lamp Assembly. Automated controls simplify the operation for multiple exposure needs. Standard with 31 channels of memory and battery back up. Printing Lamp can be raised and lowered by means of counterbalanced weight concealed inside unit, guaranteeing optimum coverage. Spring Loaded Back is furnished on the blanket frame allowing any height register pins or contact boards of any thickness. (this pump requires compressed air). (D) 5-Drawer Ball Bearing Cabinet mounted inside frame.